Because of his duplicity in proclaiming spiritual benefits of “magic mushrooms” as psychoactive drugs, while simultaneously accepting CIA funding for his exploits, the newspaperman and banker Gordon Wasson could be considered a “Lifetime Actor” — that is, a person who cultivated a public image which was completely the opposite of his true agenda. Another possible “Lifetime Actor” was the famous humanist Gregory Bateson. Bateson was an early supporter and teacher at Esalen, an organization devoted to personal growth, meditation, massage, Gestalt, yoga, psychology, ecology, spirituality, and organic food. Yet although Bateson cultivated this image during the Cold War period, he had earlier been a major participant in the creation of ‘Weaponized Anthropology’ for the OSS to control ‘inferior peoples’. The ‘weaponized Anthropology’ Bateson developed during WW2 was documented by Dr. David H. Price in his article, “Gregory Bateson and the OSS: World War II and Bateson’s Assessment of Applied Anthropology,” as well as his book Anthropological Intelligence: The Deployment and Neglect of Anthropology in the Second World War. Price found that during the second world war, the OSS (direct institutional predecessor to the CIA) employed over two-dozen anthropologists including Gregory Bateson. By 1947, as many as three-fourths of professional anthropologists were “working in some war-related governmental capacity”, either full or part-time. In fact, what we know as the science of “applied” anthropology was a government project that began in the OSS to determine how to control civilian populations. It is an established fact that these anthropologists were developing social science that could be used against civilian populations. As shown below, what has not been understood is that this science was used by the CIA against the American people in the creation of the 1960’s counter culture. Price noted that “Bateson spent much of his wartime duty designing and carrying out ‘black propaganda’ radio broadcasts from remote, secret locations in Burma and Thailand, and also worked in China, India, and Ceylon.” Bateson was ideally qualified to pursue this work, since his earlier anthropological research was on the subject of “schismogenesis”, which is to say, the study of how societies become divisive and dysfunctional. In his first major anthropological study, Bateson studied the Iatmul tribe in New Guinea. From his fieldwork, he concluded that an Iatmul village is nearly perpetually threatened by fission of the community because it is characteristic that intense and growing rivalries occur between two groups. It puzzled Bateson that usually the community does not disintegrate. He found that one elaborate event heading off a blowup is the elaborate “Naven” ceremony which entails tranvestism and buffoonery. The nature of the ‘black propaganda’ Bateson developed during WWII needs to be completely understood by citizens because it was the basis for the present ‘mind control’ operations the government uses against them. As Price wrote: “In this work Bateson applied the principles of his theory of schismogenesis to help foster disorder among the enemy.” Black propaganda is false information that purports to be from a source on one side of a conflict, but is actually from the opposing side. The fact that the source of the propaganda must be credible is the basis of what we have named the ‘lifetime actor’ above. This is clear in the case of Wasson given above as certainly the public’s willingness to repeat his purported use of psychedelic drugs would have been tempered if it were aware that his journeys to Mexico were an MK Ultra project intended to determine how the government could control the minds of its citizens. Bateson’s 1944 position paper below illuminates the “Black Propaganda” type of intelligence work he carried out for the OSS. As we cannot improve on Price’s analysis, we quote his text below. eye on longer range planning, we are here to promote such a state of affairs in [South Asia] that twenty years hence we may be able to rely on effective allies in this area (Bateson 1944:1). He begins by arguing that “it will actually pay the Americans to influence the British towards a more flexible and more effective colonial policy” (1944:2). In this paper, Bateson envisions that the post-war period will mostly look and function like it had in the pre-war period. He identifies two significant “faults in the pre-war colonial system” (1944:2). Bateson wants to strive for a new and improved colonial system, and starts by asking if it is possible to: “diagnose remediable faults in the British and Dutch colonial systems and can we present our diagnosis to the British and the Dutch in such a way that the system will be improved?” (Bateson 1944). These “two weaknesses of the imperial system” (1944:5) are labeled the “lack of communication upwards from the native population to the white [population]” (1944:2), and the British failure in the area of the “delegation of authority” (1944:4). Each of these two points are discussed separately below. Bateson points out that after the First World War colonial managers abandoned these personal meetings with native populations, instead favoring more distant statistical approaches – and British managers suffered from this loss of first-hand interactive knowledge. Next, Bateson discusses the past importance of information which colonialists gathered through intimate contact with their local mistresses. He notes that the strategic uses of these relationships have been relegated to the past due to a variety of factors. In these passages, Bateson clarifies that the extent to which past British colonial authorities in India had established groundup communication networks – including those with their indigenous mistresses – helped them to understand and control some of the features of Indian village life. The loss of these relationships between colonizer and colonized is noted in the context of loss of information, with the clear implication being that post-war colonial authorities would be wise to re-introduce some variety of such “ground-up” communication networks. Bateson’s analysis is arguing that the British would be more effective colonialists if they would become less like British parents and more like American parents. Though he does note the presence of indigenous anti-colonialist movements, he does not recommend moving towards dismantling the colonial system at war’s end. Instead, he offers advice on how to improve it functionally – that is, to reinforce its longevity. Bateson clarifies that the U.S. should not side with the growing liberation movement and he advises that “we ought not to think of altering the imperial institutions but rather of altering the attitudes and insights of those who administer these institutions” (1944:5). This is in some sense a culture and personality based analysis of the differences in British colonial and American neo-colonial approaches to the administration of global patron/client relationships. Bateson is advocating that the longevity of the British presence in India would be strengthened in the postwar period if British administrators would but change the “personality” of the administrative bureaucracy. In the paper’s conclusion, Bateson recommends that after the war the OSS should take four steps – to take advantage of these above mentioned “two weaknesses of the imperial system” (i.e., the lack of communication upward and the British delegation of authority). It is not exactly clear to what end these “two weaknesses” are to be put, but it is clear that they are not to be exploited as a means of ending the foreign-colonial rule of the Indian people. Bateson recommends that: First, the OSS should gather as much intelligence as possible from British sources – while the wartime alliance is in place; Second, they need to undertake detailed analysis of pop culture – especially in terms of content analysis of Indian popular films – as a way of gauging popular sentiment; Third, and most importantly, America must learn from Russia’s successes in conquering ethnic minorities by praising and co-opting aspects of their culture – on this point he specifically suggests that it might be possible to co-opt some components similar to the symbolic capital that Gandhi has used so successfully; and finally, Bateson suggests that the postwar OSS be sure to continue with its wartime education programs for colonialist authorities. Of course, the OSS was disbanded at the end of war. Or more accurately, it was transformed into the Central Intelligence Agency – the agency which kept the copy of Bateson’s report until I gained a copy of it under the Freedom of Information Act …. (3) The most significant experiment which has yet been conducted in the adjustment of relations between “superior” and “inferior” peoples is the Russian handling of their Asiatic tribes in Siberia. The findings of this experiment support very strongly the conclusion that it is very important to foster spectatorship among the superiors and exhibitionism among the inferiors. In outline, what the Russians have done is to stimulate the native peoples to undertake a native revival while they themselves admire the resulting dance festivals and other exhibitions of native culture, literature, poetry, music and so on. And the same attitude of spectatorship is then naturally extended to native achievements in production or organization. In contrast to this, where the white man thinks of himself as a model and encourages the native people to watch him in order to find out how things should be done, we find that in the end nativistic cults spring up among the native people. The system gets overweighed until some compensatory machinery is developed and then the revival of native arts, literature, etc., becomes a weapon for use against the white man (Phenomena, comparable to Ghandi’s spinning wheel may be observed in Ireland and elsewhere). If, on the other hand, the dominant people themselves stimulate native revivalism, then the system as a whole is much more stable, and the nativism cannot be used against the dominant people. OSS can and should do nothing in the direction of stimulating native revivals but we might move gently towards making the British and the Dutch more aware of the importance of processes of this kind (Bateson 1944:6-7). Dr. Price was unable, of course, to recognize the importance of Bateson’s recommendation above concerning an archaic revival in controlling populations because he was unaware that the government had created the ‘psychedelic counterculture’. However, every citizen should study the concluding quote from Bateson carefully. Bateson’s recommendation can certainly be understood as having led directly what the psychedelic drug guru Terence McKenna described as the ‘archaic revival’. In other words, the counter culture in the 1960’s was created by using ‘black propaganda’ to bring about an archaic revival of America’s youth and thereby make them easier to control, as had been determined by the secret anthropological experiments that Bateson somehow knew about. The documents obtained through the FOIA reveal a clear and sinister trajectory. That anthropologic science that was developed to enslave Russia’s Asiatic tribes by bringing about a Native Revival was used against the American people. Bateson brought his science with him when he helped developed the MK Ultra program which then created the counter culture based upon the elements that the Russians had used to enslave the Asiatic tribes – the Shaman, psychedelic drugs, ‘trance music’ and dance were combined with the archaic appearances of the music idols to convey the message that the feudal past was where a young person should head — rather than a future with the technology and thinking power that might threaten the oligarchs. Following the war (as Price explains), Bateson claimed to have become “uneasy” with his wartime role as an OSS operative and black propagandist, as he cultivated relationships within the human-potential movement. However, there are reasons to doubt Bateson’s sincerity in this regard. …the bomb would shift the balance of warlike and peaceful methods of international pressure. It would be powerless, he said, against subversive practices, guerrilla tactics, social and economic manipulation, diplomatic forces, and propaganda either black or white. The nations would therefore resort to those indirect methods of warfare. The importance of the kind of work the Foreign Economic Administration, the Office of War Information, and the Office of Strategic Services had been doing would thus be infinitely greater than it had ever been. The country could not rely upon the Army and Navy alone for defense. There should be a third agency to combine the functions and employ the weapons of clandestine operations, economic controls, and psychological pressures. In spite of Donovan’s protest, Truman disbanded the OSS in 1945. However, in 1947, Bateson and Donovan’s recommendations emerged victorious, and the various US intelligence agencies (including those that had been split off from the former OSS) were re-assembled as the new Central Intelligence Agency. Given Bateson’s argument for its existence, it is no surprise that it immediately began to perfect the science of social control. One project in this vein had the name MK Ultra and funded (among other criminal activities) Wasson’s above-mentioned trip to harvest magic mushrooms. The Deputy Director of the CIA revealed that over thirty universities and institutions were involved in an “extensive testing and experimentation” program which included covert drug tests on unwitting citizens “at all social levels, high and low, native Americans and foreign.” Several of these tests involved the administration of LSD to “unwitting subjects in social situations.” At least one death, that of Dr. Olson, resulted from these activities. The Agency itself acknowledged that these tests made little scientific sense. The agents doing the monitoring were not qualified scientific observers. Anthropologist and philosopher Gregory Bateson then worked at the Veterans Administration Hospital in Palo Alto. From 1959 on, Dr. Leo Hollister was testing LSD at that same hospital. Hollister says he entered the hallucinogenic field reluctantly because of the “unscientific” work of the early LSD researchers. He refers specifically to most of the people who attended Macy conferences. Thus, hoping to improve on CIA and military-funded work, Hollister tried drugs out on student volunteers, including a certain Ken Kesey, in 1960. Kesey said he was a jock who had only been drunk once before, but on three successive Tuesdays, he tried different psychedelics. “Six weeks later I’d bought my first ounce of grass,” Kesey later wrote, adding, “Six months later I had a job at that hospital as a psychiatric aide.” Out of that experience, using drugs while he wrote, Kesey turned out One Flew Over the Cuckoo’s Nest. He went on to become the counterculture’s second most famous LSD visionary, spreading the creed throughout the land, as Tom Wolfe would chronicle in The Electric Kool-Aid Acid Test. The American Gregory Bateson, highly-praised guru of the European future workshop scene, once developed models of communication theory for use in the military, in a circle of “chosen ones”, the Palo Alto group. Their civilian waste-products have today seeped into everyday-life vocabulary, as for instance the terms “metacommunication” and “double bind”. The term “metalog”, which the strategists of the “future workshops” use, originates in Bateson’s work and means something as harmless as the fact that the contents of a discussion are always to be connected with the form of the discussion. Among other things Bateson was active in the research and therapy of schizophrenia. He demonstrated the conditions in which human beings can become schizophrenic, i.e. mentally confused, so that they slip off into a psychosis and are no longer able to master their lives. In the mainstream literature on Bateson, his work is highly praised as being to the benefit of people, in particular to those who acquired a form of psychological disorder. It was not the work in the Californian Esalen institute that made him an esoteric, but it deepened his knowledge of group dynamics and large group control, the mainstream media report about him. So far, so good. Research into schizophrenia – what for? If one reads, however, the accompanying text of David H. Price on Bateson’s activities for the OSS (predecessor of the CIA) during World War II and his suggestions, how the colonial peoples are to be subjugated even after the war in a more effective way than the British and the Dutch had ever done it, some doubt arises on the integrity of the psychological researcher Bateson. Was it not interesting for the military to use the results of schizophrenia research in order to shatter the minds of prisoners of war and drive them mad, in order to be able to rebuild their personality again – or do so with whole subpopulations in “enemy nations”, or even in the[ir] own country? Bateson used his anthropological knowledge not only to the advantage of but also directed against human beings. We therefore have to assume that during the Cold War and probably still today power strategists use the findings of his schizophrenia and/or disorder research to direct them against human beings. Finally, as we also noted recently elsewhere at this website, Bateson was also involved in the development of neuro-linguistic programming (NLP), another important technology for propaganda. Bateson had established a scholarly relationship with hypnotist Milton Erickson as early as 1932. …Bateson would have been fascinated with Erickson’s research, which involved the idea that hypnotically effective trance states could be established in the course of ordinary life activities such as reading, talking to a therapist, or watching motion pictures, especially if intense and traumatic emotional states could be evoked by the experience. During such trance states, Erickson believed, the subconscious mind of the the target could be accessed by means of hypnotic suggestion…. This idea was later taken up by Bateson proteges Richard Bandler and John Grinder, who commercialized it as the system of “Neuro-Linguistic Programming”, described in their 1975 work “The Structure of Magic“. They drew on Noam Chomsky’s theory of transformational grammar to explain that the subliminal messages could be formed within a deep linguistic structure lurking beneath the surface interpretation. While we cannot demonstrate a direct relationship between Bateson and the CIA during the postwar period (that is, after the termination of Bateson’s contract with the OSS), nevertheless the pattern of his research interests creates a reasonable doubt that Bateson never deviated from his agenda to promote ‘superior’ people in their quest to subjugate the ‘inferior’ ones. Following the war Bateson headquarters was at the Palo Alto VA hospital were the CIA developed the MK Ultra project, which had earlier sent Gordon Wasson to Mexico and began the psychedelic drug movement. Also in Palo Alto, the CIA-funded drug research program introduced the individuals who would later lead America’s youth off a cliff to LSD – Alan Ginsberg, the Grateful Dead member Robert Hunter and novelist Ken Keasy. 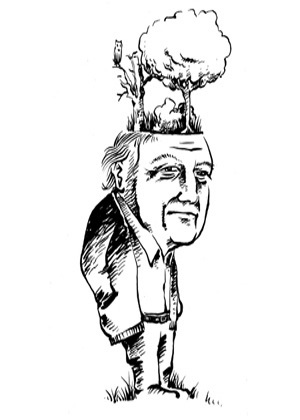 Illustration of Bateson at the top is mine (drawn for me by Shannon Wheeler) and used by this Postflaviana website without permission or attribution. oh no – that’s horrible! Oddly, it *is* credited – but to https://comunidad3h.wordpress.com/tag/gregory-bateson/ ?? I guess they just searched for Bateson images – related images gives a few more instances? Do you want me to remove it from here? Yeah, the nature of the medium. Not really worth chasing down all the unattributed instances, but the tone of this article got my hackles raised. I wrote the Postflaviana folks a takedown request.